There’s a fascinating anecdote in a recent biography of Ezra Pound that I came across one day a while back. I’d never heard it before, and it seemed like the stuff of urban legend, partly true, partly made up. Yet from A. David Moody’s biography, Erza Pound: Poet, apparently it’s all true. It got me thinking about how writers relate to each other, what they owe each other, and what matters in the grand scheme of things. Doubtless, if you’ve read T.S. Eliot’s “The Wasteland,” published in 1922, and studied its language and composition, you’ve heard that Pound played an important role in its editing (having suggested to Eliot that he cut the poem by at least two-thirds, which he did), and suggesting that he re-title it as well, which, again, he did. For his contributions, Eliot dedicated the poem, which changed the landscape of 20th century poetry, to Pound: Il miglior fabbro (in vernacular Italian, the greater craftsman). You’ve probably also heard of Pound’s exuberance, his boundless energy, his launching of little poetry magazines and selfless promotion of other poets and writers in Europe, particularly Paris during the 1920s and earlier when American exiles fled to the continent to establish their literary careers. Pound was a dynamo, impassioned, driven to advance the state of the art. Lesser known is the story of how Pound gave James Joyce, an impoverished Irish writer, a pair of brown shoes and how Eliot handed them to Joyce. 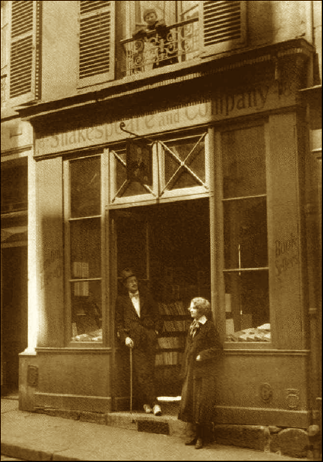 It’s a touching story, because not only did Pound introduce Joyce to all the literary types in Paris and sing his praises (ultimately, to Sylvia Beach, the owner of the famous Shakespeare bookstore, who agreed to publish Joyce’s Ulysses in 1922), he went the extra mile to lend Joyce money and make sure he had a decent pair of shoes. (Joyce was always wearing dirty tennis shoes and didn’t have the money to buy a decent pair of his own.) Now, as it happens, I’ve read a lot of Joyce, beginning with his extraordinary collection of stories, Dubliners and on through A Portrait of the Artist As a Young Man, as well as Ulysses, and good chunks of Finnegans Wake. Joyce went through more grief and suffering as a writer than anybody could imagine: his works were banned, expurgated, deemed “obscene,” and he lived most of his life on patronage and the good will of others. His poor eyesight and struggles to support his wife and two children are well known; he lived in exile on the continent, only returning twice in his adult life to his native homeland of Ireland, even though he wrote about it right up to the day of his death in 1941. Now, of course, Joyce is celebrated every year on June 14th in Dublin and all over Ireland, on what has come to be known as “Bloom’s Day,” the one day in the life of Leopold Bloom that Ulysses depicts through the centuries with numerous and dramatic parallels to Homer’s Odyssey. When I was studying at the University of Zurich, I took my little black writer’s notebook under my arm and headed after class down to Cafe Odeon, which sat on the lip of the Zurich lake and the Limmatquai. This is where I wrote every day in longhand, scribbling madly, while smoking Gauloise cigarettes and drinking many cups of black coffee. As it happened, this is the cafe where Joyce wrote large portions of Ulysses, where Dadaism was founded, and where Lenin sat out his exile before heading to the Finland Station and commandeering the Russian Revolution. 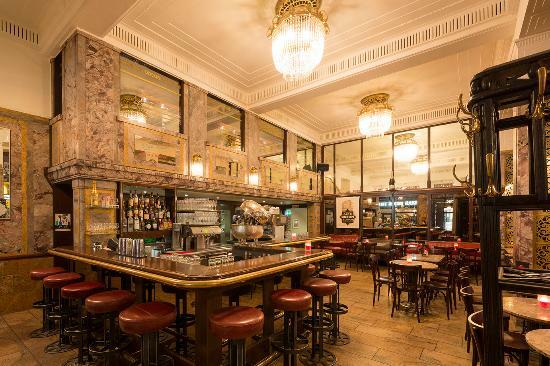 When I was there, it was said the cafe had fifty years of cigarette smoke clinging to its yellowed ceiling, and its marble tabletops spoke of a European grandeur with deep roots in the artistic traditions of the nineteenth century. After Joyce left Zurich he headed to Paris and by luck got Pound to help him out. Pound sang his praises as a genius and gave him money. In photographs of Joyce during that period, he was always wearing those dirty tennis sneakers. Times were tough for writers and poets and artists. Many were living hand to mouth, barely getting by. Yet Pound was indefatigable in his championing of writers whom he cared about, whose work he published in poetry magazines. And yes, Pound got Joyce a good pair of brown shoes and persuaded Wyndam Lewis, an English poet and writer, and T.S. Eliot to pass along the gift to the man. Joyce, it was said, was rather surprised; he didn’t quite know how to react. Lewis and Eliot were both a bit embarrassed. Yet it happened. And I can’t help thinking, somehow, the course of literary history in the twentieth century was nudged forward an inch or two. Now I ask, in this day and age, where would you find a poet with a little extra cash willing to help out a novelist and buy him a pair of new shoes? It seems nowadays as if the competition among writers is so fierce, the rewards so tiny, so minuscule, the envy so great, that even the slightest gesture of good will toward a fellow traveler on the writing road can’t be made easily. Am I wrong? Are there in fact acts of kindness and generosity in the writing community? Probably. But I’m hard pressed to find any good examples I can point to. In my salad days as a writer, I routinely pitched the work of other writers and put them directly in touch with my agent in New York, who was the best in the business. I never asked for anything in return, figuring it was important to share resources and that in the end, we’d all come out ahead and literature would be the better for it. My philosophy, which I’d learned from the great Gertrude Stein, was that, essentially, one book doesn’t make the man or woman; it’s the lifework that really matters. That’s ultimately how you’ll be judged. In time, I tasted success and failure in my writing career, wrote good work and bad, yet kept at whatever the outcome. Rivals appeared with each book, and I got caught up with a substrata of writers who only knew, unfortunately, the emotions of schadenfreude: the pleasure they got when others fail but they succeeded. To wit: it’s not enough that I succeed as a writer but my fellow writers must fail. It went against everything I had come to believe was important in shaping good work and being a decent fellow. When I was kicking around Hollywood (out of which, eventually, came my first novel Studio) I was pleasantly surprised by the camaraderie of the writing community, the willingness, at least, to talk shop and compare notes about the comings and goings in the industry. Yet most screenwriters I knew were also very protective of their ideas because, as I’d heard, “ideas were like money in the bank.” Ideas were not freely distributed and lawsuits were common when other writers stole from one another. I wrote a couple of screenplays myself, but never got very far with them. It’s a tough business and writers are the lowest of the low in the pecking order. In the world of novel writing, you get to live in your own private Idaho, and it’s OK as long as you don’t venture too far outside the door. If you do, be prepared to get hit by the competition. There probably won’t be anybody like Ezra Pound coming to your house with a new pair of brown shoes. Today far too many people believe that hey, anybody can be a writer, anybody can write a novel, nicht wahr? You’re able to write a novel because, well, you have more time than I do (I’m busy with work and family, and whatever other excuses I can make up to account for my inability to produce a manuscript of 300 or 400 pages). It’s an attitude that still runs rampant in many circles of American life. And it’s probably why Hemingway, Pound, Eliot, Fitzgerald, Gertrude Stein, and other writers of talent and genius fled the American scene and headed to Europe in the 1920s. They supported their own, even if that meant buying a pair of brown shoes for the man who wrote Ulysses -- the greatest work of fiction of the 20th century. An excerpt from Entanglement, a Novel, which is set in Ireland on the road to Belfast. Check out the audio introduction, too.